There is a lot of new world record on 2015, and here is the most phenomenal world records on 2015. Little boy named Qu Jian Yu 9-year-old was able to complete three puzzles Rubik box by hand and his foot simultaneously. He managed to finish it in 1 minute 4 seconds . The child was admitted likes to play Rubik’s cube since the age of 5 years. His father sharpened his talent after see the talents of Qu Jian Yu. After teaching him several times, in a short time the child was more skilled than his father. The his father hired Ye Jiaxi, president of the Rubik’s Cube community in Xiamen, to become a teacher for his son. When Que Jian Yu was 7 years old, he break the Guinness World Record as the youngest person to complete the 3×3 Rubik’s cube blindfolded. According to the World Cube Association, the action was carried out within 49 seconds. A man in the UK break the world record by walking a tightrope without safeguards, this sports is also known as Slacklining. 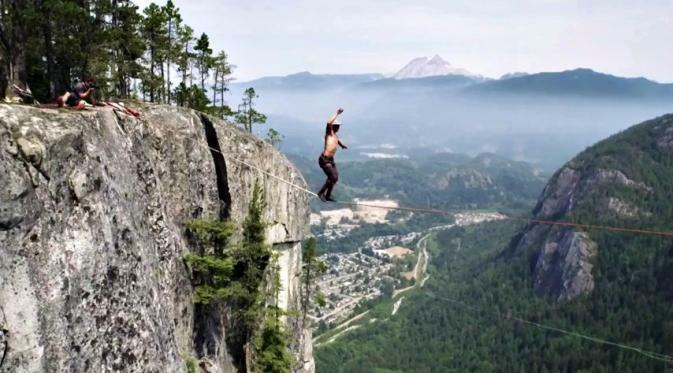 In this occasion, death challenger named Spencer Seabrooke will cross a 64-meter cliff in Squamish, British Columbia, Canada. In explanation of videos uploaded to Youtube by cameramen Zachary Moxley, identifies that this thrilling attractions is an attempt to break the world record previously done by Andy Lewis in 2011. At that time, Andy Lewis walking on a tightrope between the cliffs within 55 meters without using protection. In a reckless action that is performed on Sunday (02/08/2015) and then, look how Spencer Seabrooke initially had several times lost his footing and managed to reach the ropes with his hands so that he could escape from death. For Zachary Moxley the cameramen, desperate attraction is so terrible to be seen directly. 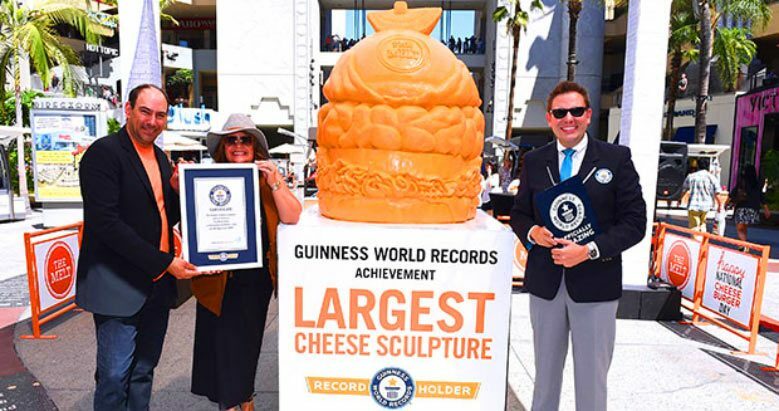 A restaurant headquartered in San Francisco successfully break the record of Guinness World Record for the world’s largest cheese carving. The Melt restaurant make the sculpture in the context of the National Cheeseburger Day on 18 September 2015. The restaurant working with sculptor Troy Landwehr to create a masterpiece formed cheeseburger that weighs more than 691 kilograms (6.9 Quintal) Whole cheese carved. Complete with carved pickle on top, the statue was crowned as the world’s largest cheese according to the World Records Academy. Bertie, a South Africa Leopard tortoise, managed to break a record as the fastest among the creatures of turtle species. 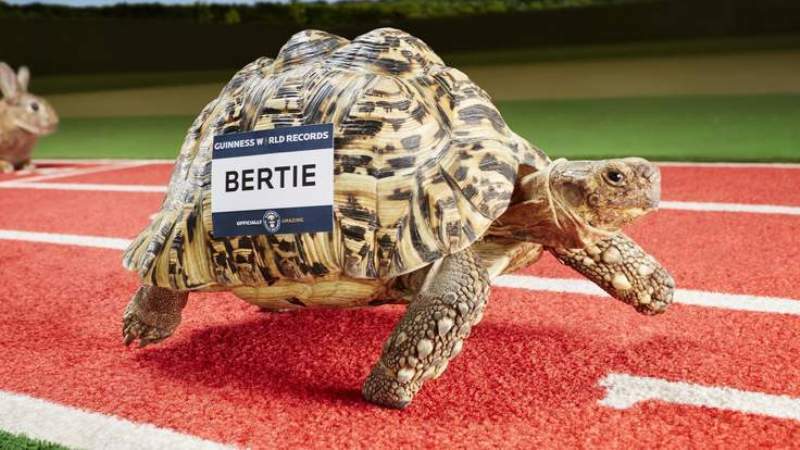 Bertie reportedly able to cover the distance of 100 meters “only” within six minutes. To get the title, Bertie run a distance of 5.4 meters in 19.59 seconds at a track at Adventure Valley, Durham, England, in July 2015 ago. With an average speed of 0.28 meters per second, Bertie broke the record Guinness Book of Records as the fastest turtle. The previous record held by Charlie of South Yorkshire which takes 43.7 seconds to travel the same distance in 1977. Recently, the scientific community from China released their new invention to the public. A group of researchers found land snail population with a very small size. In fact, the snail was claimed to be the smallest in the world. The researchers found that the snail species in Guangxi Province, southern China. The snail species known measuring only 0.86 millimeters, including the shell. In fact, because of the very small size, to the extent that the pinhole can be entered by 10 snails. Researchers consisting of Pall-Gergely Barna and Takahiro Asami from Shinshu University of Japan, Adrienne Jochum and Andras Hunyadi of the University and the Natural History Museum of Bern, reportedly has found at least seven new snail species worldwide. Snails were found in the Guangxi province is the smallest snails they could find. The snail was found in a soil sample taken from the base of a cliff in Guangxi Province, southern China.